The unintentional heart-shaped final product. A mouth-watering breakfast is one of the simple pleasures I enjoy most. It could consist of a vegetable omelet, fresh fruit salad, cinnamon flavored french toast, or pancakes. Today, I opted to make my favorite recipe for banana pancakes. Even my fiancee, Eric, couldn’t help but get up as soon as he smelled them cooking. The aroma is subtly sweet, just as the flavor is. In the past, when I’ve made whole grain pancakes they tasted like a piece of wheat bread instead of like of like the pancakes I grew up tasting (which were unfortunately not healthy, but were lightly sweet and delicious). Then I stumbled upon this recipe. I’ve been using it ever since. The breakfast cakes always taste of bananas with subtle hints of nutmeg and cinnamon. Sometimes I vary the recipe depending on the ingredients I have. As promised I made sure to use coconut oil in this recipe and they came out just as delicious as they usually do (when I’ve used butter). UPDATE: Recently after doing some online research, I learned that using oat flour on its own can lead to a gummy end product. Supposedly mixing oat flour with rice four can create a more even texture in baked goods. 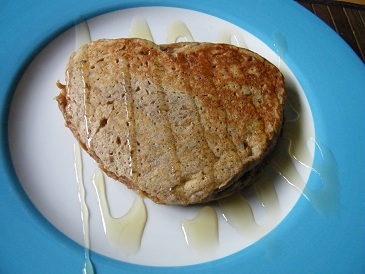 If you try these pancakes with oat flour you may either want to use less liquid ingredients or do a half and half mix with rice four for a better texture. 1- Mix all of the dry ingredients together in one bowl. 2- In a separate bowl, mash the bananas. Then add in the other wet ingredients listed after the bananas on the ingredient list. Mix well. 3- Meanwhile heat a frying pan to medium heat and melt a little bit more coconut oil in the bottom. 4- Add the dry ingredients. Stir until they are incorporated with the wet ingredients. 5- Add the 1/2 cup size scoops to the frying pan. You may have to spread them out a little bit with the measuring cup to flatten them out (as the batter will be thick). Cook them for about 4 minutes on one side (or until the bottom starts to brown and the top starts to slightly bubble – they do not get as bubbly as normal pancakes). On the other side cook them for about 1-2 minutes, or until they start to become slightly brown. *On a side note, I think that you could use applesauce instead of bananas if you wanted to make apple pancakes, but I haven’t experimented with that yet. Lastly, top with your favorite pancake toppings like fresh Vermont-made maple syrup. Feel free to post any of your favorite breakfast recipes below! Thank you for checking out the recipe. The pancakes were delicious 🙂 Next time I will try to add in crushed flax seeds to add even more health benefits.